Hi, everyone. I know I’ve kind of disappeared for awhile. I think there have been rumors making the rounds. Yeah. It wasn’t anything that fun. Really. I’ve just been really busy with one thing and another and sort of vaguely decided to take a little hiatus to get caught up a little. I’m not caught up, but I’ve missed you. So there. I haven’t done a lot of knitting. For one thing, we’ve had some hot weather and knitting wool socks in 100+ (F) weather is just not something I’m that fond of doing. I have no air conditioning in my house, and that means that by about the 3rd day it’s the same temperature inside as outside. Not even cotton could cut it for knitting. I didn’t want any more fabric near me than was absolutely necessary. And I’ve been knitting a few things that, well, I just can’t show you. And so knitting is stalled. But I will soon show you progress on the poor Andes Mint socks that I started way long ago. And I will soon show you some yarn I acquired (just a bit). But there hasn’t been much knitting to talk about. And #1 Son hasn’t even done anything blog-worthy. It’s the summer doldrums, I guess. And what better way to fight the summer doldrums than with a State Fair? Or with a little knitting in public? Or…hey… let’s combine those! That’s the ticket, I think. 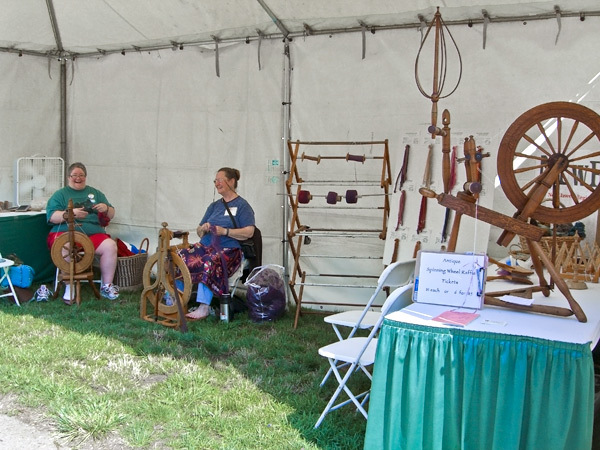 And so yesterday I went down to Salem to the Oregon State Fair with Duffy to knit in the Northwest Regional Spinners Association booth in the Artisan’s Village. Check out the gorgeous antique wheel that they are raffling off! Now, it’s true that I don’t spin. But, it turns out, they were happy to have someone along to show what could be done with fiber after it was turned into string. I worked on my socks. And I wound a skein into a ball on a nostepinne, because that might be construed by some to be interesting. And I even got to add a little info by explaining to one visitor that winding the ball in that way helps keep the yarn from being overstretched. So I guess I sort of earned my keep. Even though mostly I just sat and knit. Oh… and ate a corn dog. I can’t go to a State Fair and not eat a corn dog. I mean really. One must have priorities, you know. 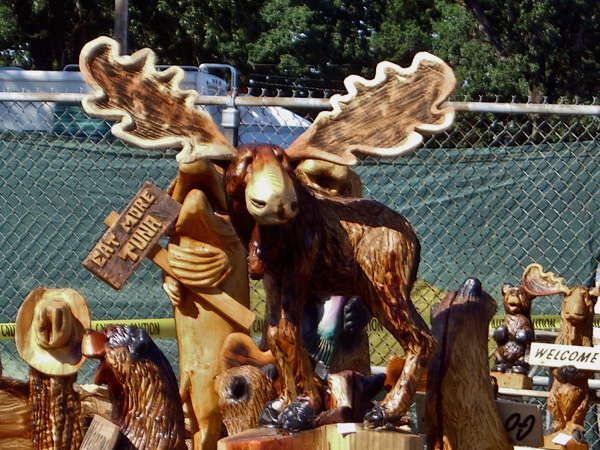 The NWRSA association booth is right across from the area claimed by a couple of guys who use chain saws to carve logs into really cool stuff. Check out the moose! I have a soft spot in my heart for moose, so I was quite taken with him. There’s no way he can go home with me, though. Even if I had room for him, he’s quite beyond my budget. But I did take a little break to go breath sawdust and look around at all of the cool things. If you make it down to the State Fair, be sure to go back to the Artisan’s Village and look around – and be sure to stop by the NWRSA booth and say howdy to Audrey and whoever else it there. Duffy and I will be back next Saturday for awhile. P.S. Check out the Techniques page, where I’ve just added Judy’s Magic Cast-On in German, translated by Arlene of Arlene’s World of Lace.